The goldenglow aphids in our garden are under attack! One of the predators that are most easily spotted are these seven-spot ladybird beetles Cocinella septempunctata. These familiar insects are attracted not by the aphids themselves, but by chemicals that the plants release only when aphids have been feeding on them. Both the adult and larval beetles are very efficient aphid predators, plucking them off the plant and chewing up their soft bodies with strong jaws. Adult beetles lay clusters of eggs on leaves that look like clumps of yellow rice. If you've ever been bitten by a ladybug larva, you know their jaws can deliver a strong pinch! Cocinella septempunctata is not native to the Americas, but was introduced from Europe and by 1973 was established as part of a biological control program for pest aphid species. This familiar insect was selected as the state insect of 6 states, including Delaware (I probably would have selected an insect more indicative of the region). Another introduced coccinellid that I commonly find in our garden is the striking twice-stabbed ladybird beetle Chilocorus kuwanae. There are native Chilocerus that look very similar but I have not yet seen one here. Next up: fearsome flower flies! Over the past several years Kiri and I have been furnishing our garden with plants native to Delaware. We do this not only because we like these plants, but also to support local wildlife (especially insects of course). While some pest insects can eat just about anything, most of our desirable insects can only feed on indigenous plant lineages that they co-evolved with. As our summer flowers are gearing up for a brilliant June display, I have been spending more and more time checking out the critters that have made their home in our yard. Despite their sucking the juices out of our plants, these aphids are a welcome visitor, and I don't worry much about them killing my flowers. Kiri noticed that while the aphids are host specific, feeding only on our Heliopsis, they do not feed on every plant of that species. The different plants have slightly different genes, and the aphids prefer certain genotypes on which they are the most successful. On the preferred plants, they have reached very high numbers, but they have also attracted large numbers of insect predators that attack aphids. A battle is unfolding amongst our wildflowers as these predators go after the huge aphid colonies - I don't think it's going well for the squishy red plant-suckers. More on that to follow! Our garden provides wildlife habitat and a place for me to watch predators and prey! I've been on a fly kick of late, and making a habit of punny post titles. One of the most striking flies in our area is the Golden-backed Snipe Fly. Although these rhagionids are rather common in early summer, they still turn my head every time I see them. Like many flies, males are 'holoptic' with their eyes touching and covering most of their heads, while females eyes are spaced apart. I presume that this is an adaptation for males identifying and following females on the wing. I'm a big fan of the entomophagy movement but this post isn't about including insects in human diets, rather, it's the other way around. 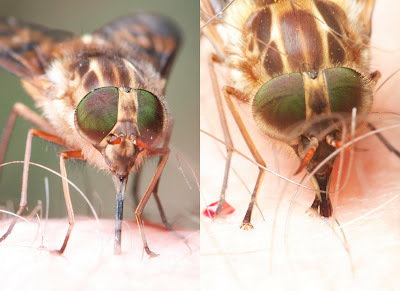 I was pleased to see Morgan Jackson's post on deer flies; not only for the interesting read and beautiful flies, but also because it's nice to be reminded that there are other folks out there who are [insert adjective] enough to let an insect bite or sting them out of curiosity or for a nice portrait session. One thing is clear from all these tabanid photos: The world is in need of some insect photographers with slightly less body hair. Insect collecting 101 - Don't do this. I know this must happen to you all the time; You're walking through the nation's capital when your spouse catches a cool membracid tree hopper. Expecting a day of subways, pidgeons, and people you neglected to bring along anything to store your quarry in - will you ever learn? As you consider a day of carrying the bug through museums in your sweaty hand, you have a flash of ingenuity. You roll your chapstick all the way to the bottom of the tube, and pop the insect inside. Brilliant! Not until you return home to photograph your captive do you realize your folly. Your jumping gem is well moisturized and coated in spf 25 'Nivea'. I wanted to end with a hilarious joke that Kiri made about this chapstick slathered tree hopper, but neither of us can remember it. Maybe something about Triatoma? Any takers? Kiri and I took a few days off this week and went backpacking in Shenandoah National Park with good friends. Rainy weather made for tough hiking and few photos, but the wildflowers were wonderful, and salamanders were abundant. To save weight and worry, I left my close up lens at home, but still got some shots with Kiri's help.